Begin our journey to the Island of Brac or stay in Split harbor. Visit the village of Vrboska. 2017 will be ROW’s 25th year in Croatia! No other adventure travel company has the breadth or depth of experience in Croatia as do we at ROW. In 1988 and 1989, long before Croatia became the new darling of travelers, we were leading trips and learning her charms. We had to pause as Yugoslavia broke apart and the various Republics won their independence. We resumed operations in 1998 and have returned every year since, leading the way for others to follow. Croatia today is a peaceful country excited about its future and on the path to become a member of the EU. 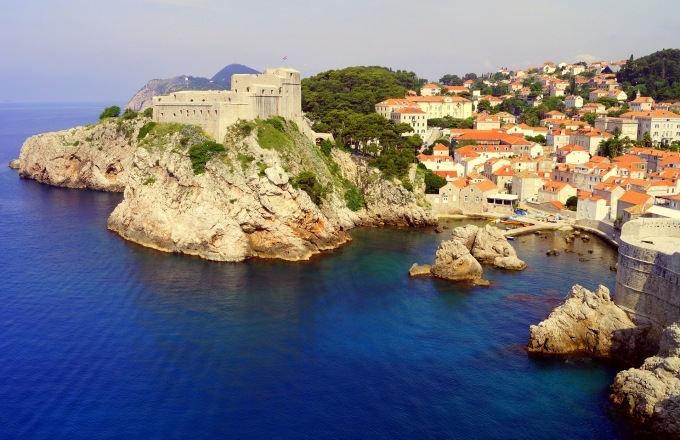 It has much to offer the traveler - the UNESCO World Heritage City of Dubrovnik, miles of beaches, isolated swimming coves, charming towns, a rich culture and friendly locals. With a Croatian guide, Croatian ship owner and crew, this trip gets you fully immersed into the local culture and history as no other can. Our primary ship, the Romanca, is in a class of its own and one of the finest on the Dalmatian Coast. 105’ in length, made of solid Slavonian oak with teak decks, the crew is professional, friendly and gracious. Food aboard is excellent, carefully prepared and artfully presented by a talented Croatian chef. In addition to scheduled departures, ROW can arrange private charters on a variety of other yachts for as few as four, or as many as 20. We invite you to wander with us on this sensational taste of Croatia! No reviews yet for this trip. Browse other reviews below for ROW Adventures. This was our first trip and definitely won't be our last! The guides are really fun and lunch exceeded expectations. Thanks so much Jake, Ben & Ashley for making this the highlight of our summer!! I've had the privilege of working with ROW Adventures all over the world as a filmmaker. Having been on so many trips, both domestic and international, I have a pretty good knowledge as to how this company operates. A few things stand out on every ROW trip, regardless of destination. First being the guides. These are people who genuinely love what they do. They're passionate, attentive, professional, safety-oriented, friendly, and generally fun people to be around. They're accommodating to individual needs and do their best to make sure you are comfortable and enjoying your vacation to the maximum. The next thing that stands out is the food. It doesn't matter if you're on a 6 day whitewater rafting and camping trip, the food is gourmet. Prime rib, chicken mole, salmon, eggs Benedict, and a variety of expansive sandwhich spreads are just a few examples of ROW's typical "camp" food. Perhaps their best feature though, is their emphasis on human connection. In the end, these are trips that are very often life changing. ROW is dedicated to curating life changing experiences that draw families closer to each other, create new friendships between guests and guides, and educate everyone involved about how tourism can work to the continued protection of our great outdoors. If you're looking at booking an adventure trip, whether it be in North America or abroad, I would recommend ROW Adventures in a heartbeat. They're a top-notch company in all the areas that count, and I would book them for any trip in the future. What a great time we had with this group!! We rafted the Lochsa, and it will be a day to remember!! Thanks Chris for giving us a fantastic ride. If you are thinking about doing a raft trip, perhaps the Lochsa? ?...do it with this group! They were Fun,entertaining, educational, smart about the river, and lunch was over the top!! This was not our first time rafting, however first time with a guide...well worth every dime. We will be back to do it again! Awesome Galapagos adventure, spectacular guides. Solved any issued we had. Went above and beyond what was expected. Thank you what a stupendous trip, headed out for the second leg to the Amazon, expecting more of the same. What a blast we had last week on the Happy Hour float down the Spokane river. What made it even better was our guide, Will who kept us laughing especially at his "geese stacking rock" joke! Can't wait for my next trip with Row Adventures!! Your the BEST! Off the Snake for 24 hours sure missing the river, slow pace! To the Guides Mark, Brit, Chris, Brian, Ashley and Maddie you were AWESOME! Great families on the trip!!! Itinerary Note: The exact itinerary is subject to weather conditions and may vary. Wind conditions are quite variable, but the seas are usually calm. In order to maximize the time available for explorations we normally travel under motor power. While the sails may go up once or twice, this should not be considered a sailing trip but rather a cruise on a motor-sail yacht. - See more at: http://www.rowadventures.com/yacht-croatia-culinary-voyage.html#sthash.2ea6zf8K.dpuf Tonight’s dinner focuses on food from the mainland and you’ll be introduced to a traditional Dalmatian pot roast known as pašticada (pahsh-tee-TSAH-dah) perhaps with a side of potato gnocchi and for dessert, a palačinke (pah-lah-CHEEN-keh, meaning ‘pancakes’). B,L,D. Custom charters available upon request. The m/y Romanca is a 105' Croatian-made motor/sailing yacht completed in July of 1998. While the yacht has 10 cabins and holds 20 passengers, we allow a maximum of 16 guest spaces accommodating room for singles and spacious living on board. The yacht has large amounts of deck space, an inside and outside dining area and is beautifully fitted. On the Romanca, two cabins are on the upper deck and are bunk-bed style, while the remaining eight are below deck and have double beds and of these, one has an upper bunk. Spacious cabins and a beautiful dining room as well as internet, mobile phone and a fully kitted out deck replete with deck chairs and a spacious area for cushions and sun mattresses. With plenty of cabins and berth space for everyone, luxury towels and complete linen services, you'll also find all of the extra equipment that you need to explore the lovely countryside. Jet Skis, Snorkels and fishing gear will ensure that you've got plenty to keep you busy while cruising Croatia. If you find it necessary to cancel your trip, please notify us as soon as possible. If written cancellation is received by ROW (call to verify) before the final balance is due, you will be given a refund less the amount of deposit. Deposits are non-refundable. If cancellations are made on or after the final due date, no money will be refunded. You are welcome to find a replacement for yourself. Please understand that once you’ve signed up, we lose the right to sell your reserved spaces to other individuals or groups. Therefore, we regret that we cannot make exceptions for personal emergencies. For this reason we a strongly recommend you consider purchasing a travel protection plan. We offer a comprehensive cancellation and trip protection plan through our office and recommend this coverage which protects your payments if you have to cancel for medical or other covered reasons. Trips are limited to just 16 guests, and smaller yachts mean a more intimate and personal trip experience. We provide a dedicated trip leader who will be with you for the entire journey. All of our guides are local, and they all love to share their country's beauty, culture and history with guests. We visit the more off the beaten path locations, thus avoiding the crowds. Our itinerary is designed to provide as much or as little activity as preferred, visit as many points of interest as possible while still maintaining the balance between relaxation and discovery. While on the yacht all of your meals are included accompanied by local wines and beers in reasonable quantities.